I have already said in part. The surface on which the various pieces of cheese or cheese are resting must be spacious enough to collect them all without touching one another, and so it is easier to cut. Each type of cheese should have its own knife with curved tip and the final hairpin. The crumbly cheeses such as “grain” will be complemented with a special almond-shaped stone cutter. Along with the cheese slices are served various types of bread, crackers or salty biscuits. Certain crudity may come along, a little spicy, like sprouts, radishes, chives, cheeses and even some of the chopped herbs (especially parsley and basil), salt and pepper and a bottle of no scented olive oil. Properly used, a butter dish with soft butter or a Pickle with curls of butter may be served. Accompany the fresh ricotta cheese, sweet, and the mascarpone (to be served separately) with a “duster” with sugar and cinnamon and a bottle of liquor passe partout, like rum or brandy, maraschino or Cordial Campari. Accompany mozzarella with salt, pepper grinder and a bottle of oil. Do not ever remove the crust of cheese before serving, any crusts must be cut individually in the plate. 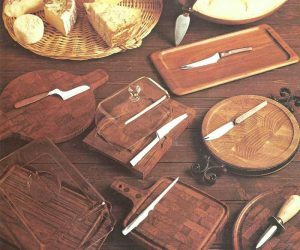 Wooden dishes for cheese, accompanied by special knives. In the picture is easily recognizable the knife blade in the shape of almonds, which is useful to cut the grain and cheese crumbly.